A very interesting series about a way of life which (for the most part) no longer exists. Although I have never been to Great Britain, I am aware of the fact that some of the most beautiful houses in the world exist there. An example of the days when homes like these were owned by the once-upon-a-time “one-percenters” is the house in the classic Brideshead Revisited (1981). It is certainly not the only one however. Five similarly amazing estates are profiled in the new, two-DVD set Treasure Houses of Britain, which was just released by Athena. The houses profiled are Burghley House, Chatsworth, Blenheim Palace, Holkham Hall, and Boughton House. All five are incredible, in fact, they are so stunning that it is hard to believe these were really “houses” in the first place. The number 90210 may be the most famous zip code in the world, but Beverly Hills has nothing to compare with these incredible properties. For one thing, there is the history. The first program in the series focuses on Burghley House, which construction began on in the 16th century. It actually took 32 years to build. One of the most incredible aspects of Burghley House are the “Heaven” and “Hell” rooms. The rooms were painted by the British artist Antonio Verrio and are awe-inspiring. The Sistine Chapel is probably the most famous example of murals of this sort. But you really need to see Verrio’s artwork in these rooms to believe them. The history of Chatsworth is just as deep as that of Burghley. It has been occupied by the Cavendish family since the mid-16th century. One of the most fascinating elements of Chatsworth is the “Emperor Fountain” in the front of the property. The engineering behind this marvel is brilliant. The fountain is fed entirely by gravity, from reservoirs built on the moor above the house. We continue the tour at Blenheim Palace. The birth of this estate came from an act of Parliament as a gift to the Duke of Marlborough. Among the various architectural distinctions, Blenheim Palace was also the birthplace of Sir Winston Churchill. Holkham Hall is a relative recent building in comparison to some of the others. It “only” dates back to 1712, when Thomas Hoke decided that north Norfolk needed a Palladian mansion. Finally we come to Broughton House, which has been called the “English Versailles.” This is perhaps where the title of the series, Treasure Houses of Britain, originated. It is hard to believe the number of literal treasures that are stored here. Among them are paintings, furniture, porcelain, and textiles brought back by Montagu from France. The series is hosted by the very proper Selina Scott, who arrives and departs in (what else?) a chauffer-driven Rolls. Bonus features include a 22-minute documentary “How We Did It,” which offers a behind-the-scenes look at the production of the various episodes. Athena also has included a 12-page viewers guide. This contains some interesting articles, including one on the English aristocracy and the fate of country homes, many of which have been abandoned due to the costs of maintaining them. 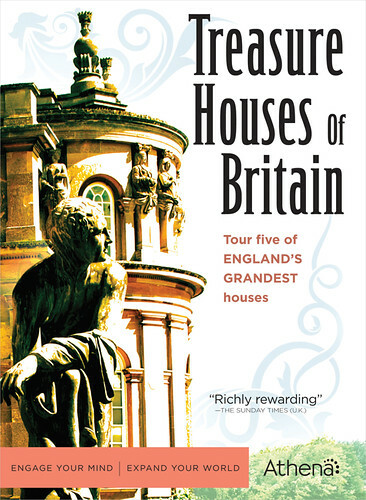 Treasure Houses of Britain is a very interesting series about a way of life which (for the most part) no longer exists. Like so much of the Athena releases, this is a most illuminating British series. Maybe the Occupy people should view it to see what the “one-percent” world looked like a few hundred years ago. Trump has nothing on a place like Chatsworth or Boughton House .